The Lost Sword duology is an epic fantasy in two parts: Dragon’s Rook (2015) and Dragon’s Bane (2016 or TBA). Dragon’s Rook introduces Captain Gaerbith, a shepherd turned soldier, and Kieran Smith, an orphan raised by a blacksmith. They do not yet know one another, but their destinies are interconnected. Before the end of the second book, they will join forces to find the lost sword, end a war, and fulfill ancient prophecies — but not, perhaps, as the ancients expected. Many others join them on their journeys: friends, enemies, kindred, friends as close as kin, and enemies who may become allies. Gaerbith becomes betrothed to a high-born lady, and Kieran loves a mysterious healer with a crippled hand. And there are Dragons, who — like the others — have secrets of their own. 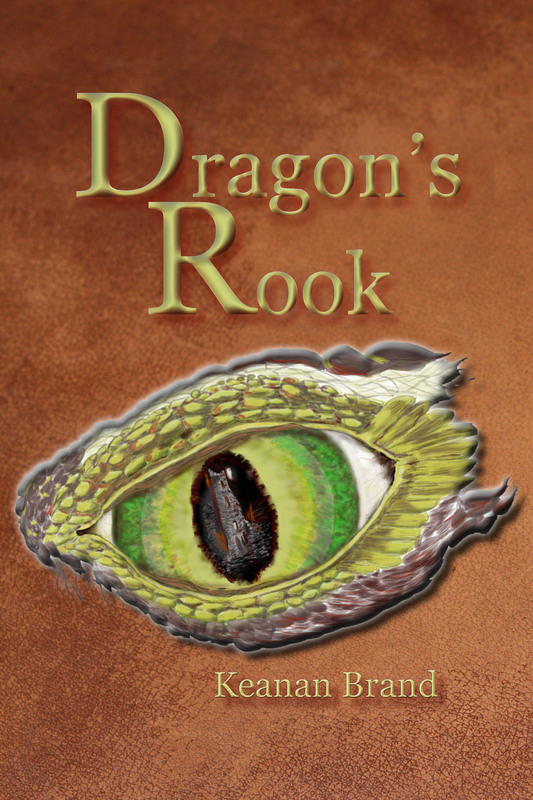 The e-book version of Dragon’s Rook is available for free on Smashwords for another two weeks (coupon code: XM56N). There is a menu of format options available. Writerly request: If you download the book, please be gracious and do an author a favor — leave a review on Amazon, Goodreads,Smashwords, Barnes & Noble, Shelfari, or any other book website of your choice. Note: If you’d prefer the paperback, it is $19.99 on Amazon. FYI, the awesome dragon eye was drawn by Suzan Troutt. Find her at Jade’s Journal or at Gothic Tones (store, blog). Thanks to input from a friend, I upgraded the cover art for Dragon’s Rook. 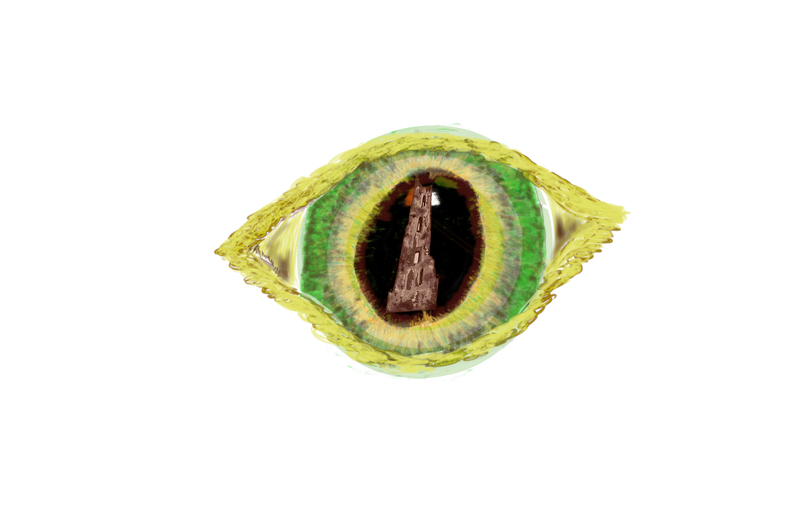 The eye is looking down as the dragon swoops toward the tower. The castle tower itself is shaded in with more detail. When Keanan asked me if I’d draw the cover art for his book, I accepted the job and felt honored to be chosen for the work. As a child the public library was my playground of choice and I suspect that deep down it has always been my dream to be a cover artist! But there was a problem. I was trying to break into the design world via my Bamboo tablet (a graduation gift). I’d already faced the challenge of learning to draw on a flat surface while looking at the laptop screen to see where my stylus was pointing. How I wished I had a tablet with a screen as I struggled to get my hand-eye coordination right! For an artist used to drawing on paper, it was certainly my first hurdle to overcome. Practice improved my skills, and I felt ready to try a larger project. Though I searched online for images to inspire the work, I felt drawn to the idea of a circle in the middle of the book cover. 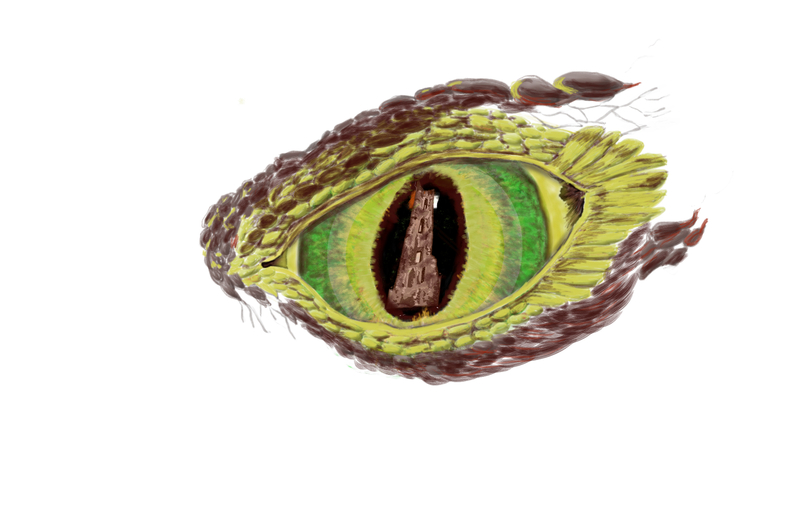 A single dragon eye, like the picture Keanan had posted on his blog. We talked about it, and Keanan liked the idea. It almost seemed to pay homage to a hardbound book he recalled from the Lord of the Rings trilogy. The Eye of Sauron. 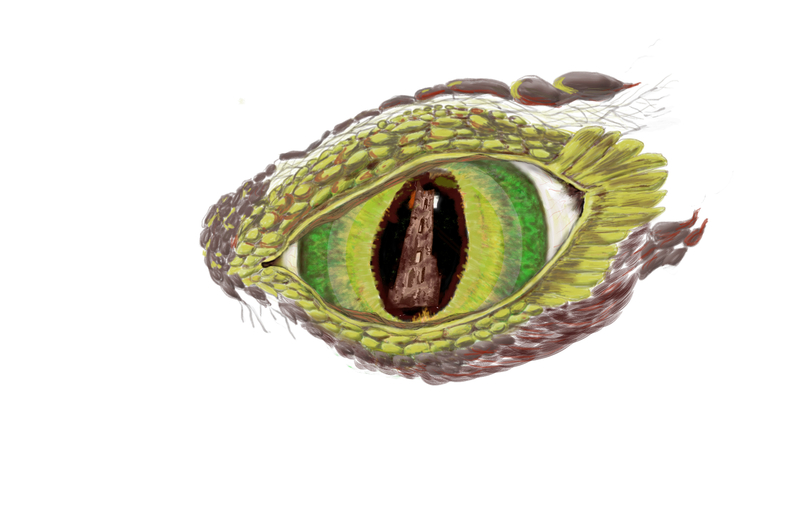 The eye of the Dragon King. We decided that a castle tower would be reflected in the pupil. A simple and thought-provoking image, telling a tale, inviting the reader to open the book. Or in this case to purchase it for their e-reader, since Dragon’s Rook will be published electronically first. 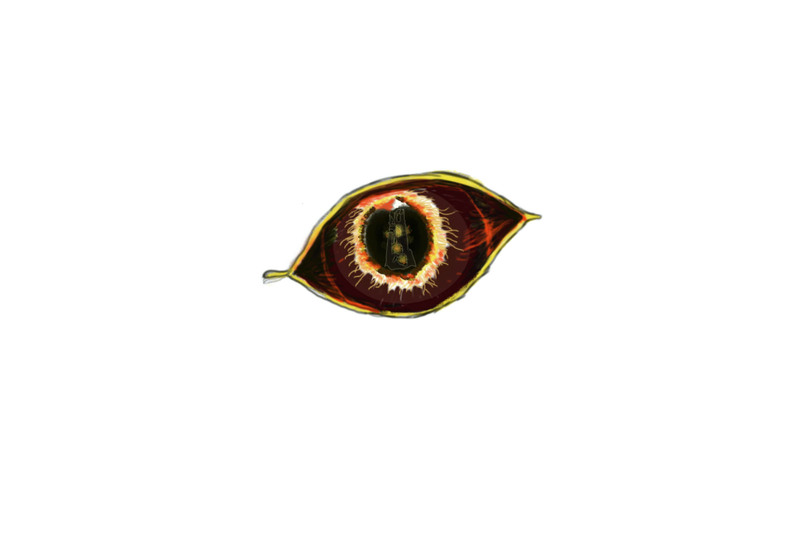 My initial offering was a rather menacing eye, but still not detailed enough to catch the reader’s attention as a thumbnail image. You can see this below. Finally the image began to look more like something we both felt was getting close to the vision. I wanted to add smoke and fire, but felt it would complicate the image too much. Keanan suggested creating a white for the eye rather than using the yellow background for the iris. I also wanted to add wrinkles to indicate the creature’s age. I decided to build up the scales with the bevel effect with the Bamboo oil and dry brush tools. The scales reminded me of cobblestones. The bevel effect made them pop with an almost 3D-style! The details faded as the viewer got further from the center of the eye. Like a tornado, the swirling scales pulled a sharper focus toward what the dragon was viewing. We felt that our vision for the cover was simple, intriguing, and menacing! We plan to use a very similar style for the Dragon’s Bane cover. This is the next book in the series, and it will feature the eye of a different dragon character, with a sword instead of a castle tower in the iris of the eye. This image is not shown at full size, but should give a good idea of our design plans for the book. Feedback on this design is greatly appreciated as we finalize the project!